This new Linear DT-2D remote replaces older models DT-4A, DT-4B, DT-4D, DNT00027B labels. 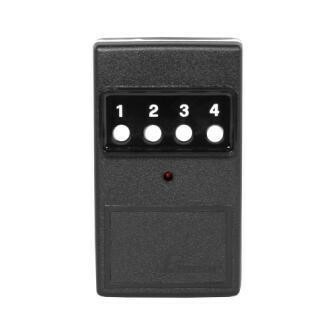 This remote will work with all Linear Delta 3 series garage door or gate operators that use 8 On/Off dip switches to set the code. This is a brand new remote that comes from a bulk purchase pack. This means that it is wrapped in a plastic bag with no box. It comes with visor clip, battery and programming instructions. Codes are set by matching the switches to a working remote or matching codes in the receivers. The DT-4D can be used with 1 four channel receiver model DR4, 2 two channel receiver model DR2 and 4 one channel receivers models DR or DRQP.